Stanley & Agota (Agnes) Baltramiejunaite Makarauskas and her uncle. 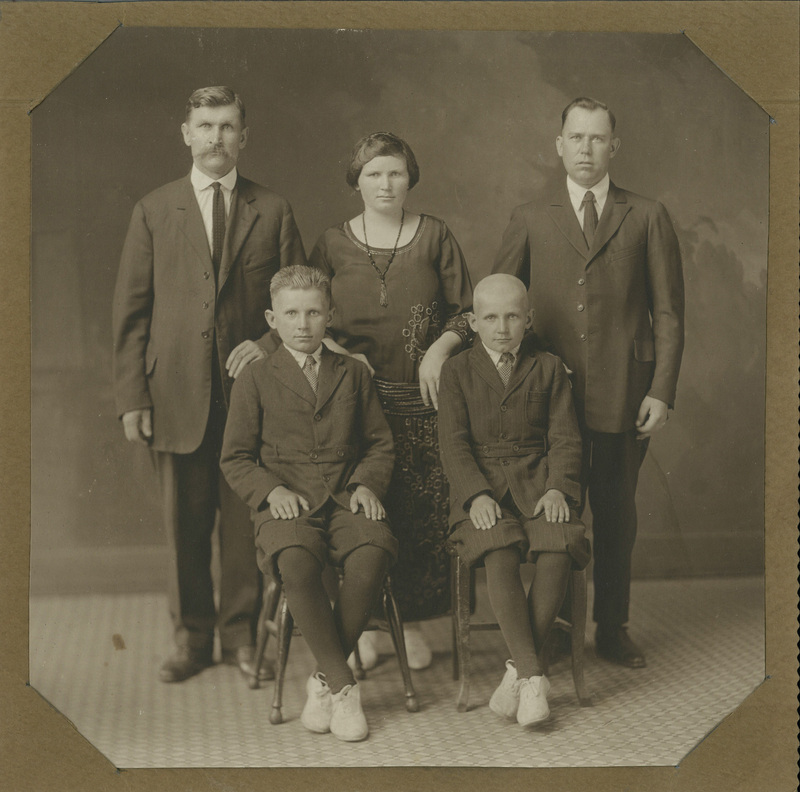 Front row l to r: Sons Michael and John Makarauskas, 1922, the day Agnes & her two children immigrated and were reunited with Stanley, who arrived in the U.S. in 1914. Thousands of local youth–boys, only, at first–earned their first paycheck at one of Springfield’s first 8 McDonald’s restaurants opened by the Makarauskas (Mack) family starting in 1957. Previously, I posted all the Mack “McHistory” that I could find in public records. This week, we benefit from the memories and photos of Jim Mack, Mary Ann (Mack) Butts, and Dorothy Makarauskas. It’s hard to overestimate the impact of Springfield’s first fast food on local eating habits and teen employment and culture. Through the 1970s, despite paying only minimum wage, the McDonald’s on S. MacArthur Blvd. (opened in 1961) was not only THE place to work. It became such a popular teen and “hippie” hangout that the packed parking lot required its own bouncer. Hot rods cruised around the restaurant and up and down MacArthur a la “American Graffiti” every Friday and Saturday night. 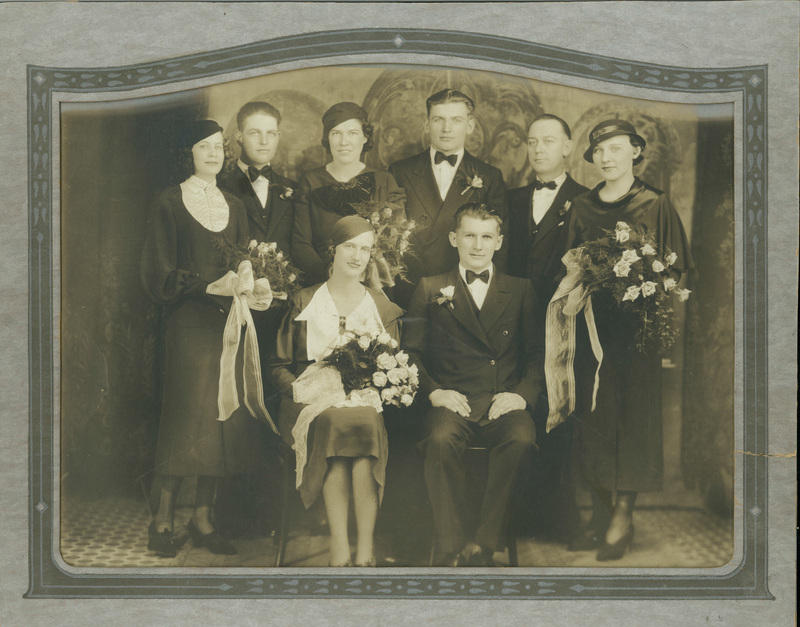 Michael Makarauskas wedding, circa 1930. Brother John standing directly behind the seated groom. Many miners now gone considered John Mack a hero because of the way he supported the Progressive Miners of America by “carrying” his striking brethren on credit at a grocery store or informal, home-based “commissary” during the deepest trough of the Great Depression, when he and thousands of other miners were thrown out of work by the Central Illinois “Mine Wars” (as reported on page 92 of the book Divided Kingdom). However, the first John Mack grocery store remembered by Dorothy Makarauskas, wife of John’s much younger brother Frank, operated from 1941-43 on 1st St. just south of Laurel. 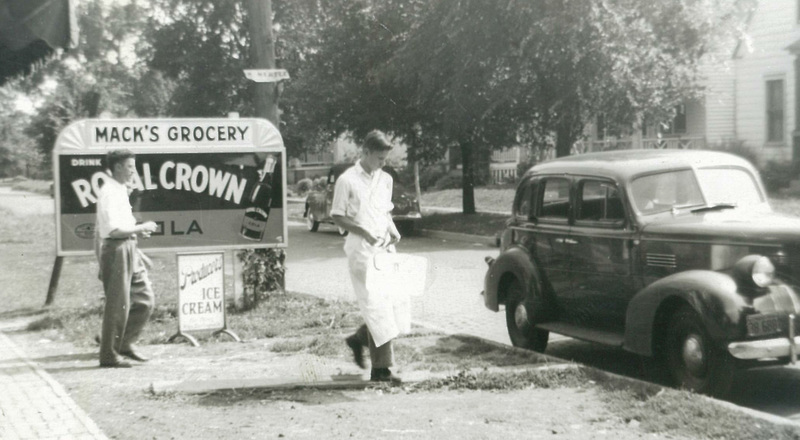 John closed the 1st St. store and opened a larger store at 1501 Keys Ave. in 1943. John’s son Jim Mack remembers the financial squeeze his father faced as he continued to broadly extend store credit well into the 1950s, worsened by the arrival of the first supermarket chains that began eating the independent grocers’ lunch. Then one day McDonald’s founder Ray Kroc entered the picture. Jim was living on S. 6th with parents John, Sr. and Mary (Gidus) Mack, brothers Tom and John, Jr. and sisters JoAnn and Mary Ann when he says Kroc drove by the main gate of the huge Allis Chalmers construction machinery factory across the street. That’s when Kroc approached John Mack, Sr., simply because he considered the real estate across from Allis Chalmers the perfect site for Springfield’s first McDonald’s restaurant (the nation’s 69th). 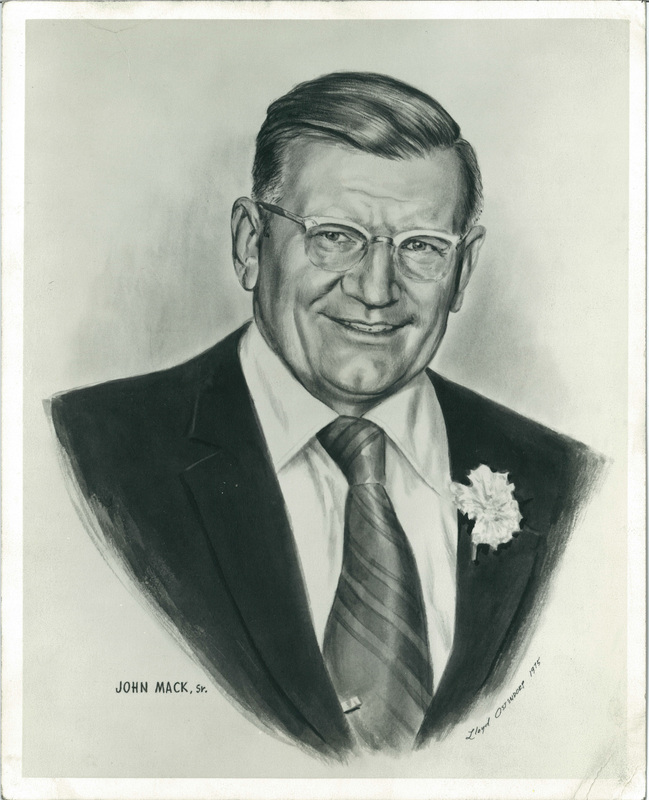 It was serendipity that John, Sr. was a butcher able to provide ground beef, but struggling to survive in the dying corner-grocery business. It was also the opportunity that John, Sr. had been waiting for all his life. He accepted Kroc’s proposal to replace the site of the family’s home with a McDonald’s drive-up restaurant. But, first, he had to borrow $100,000—akin to borrowing almost a million dollars today—in order to clear the site, move his family’s home around the corner, build the restaurant and parking lot, and pay his franchise fee. John, Sr. didn’t give up. Illinois National Bank finally agreed to make the loan, and out of loyalty, Mary Ann recalls, the Macks continued to do their McDonald’s financing through INB even after John, Sr. died in 1974 at age 61. “Dad didn’t have a long life, and he only had so much education, but he had guts and he was really smart—very good at math. He only had a sixth-grade education, but he died a millionaire, and we are very proud of him,” Mary Ann said. Coming Next Week: Chapter III of Springfield’s Mack “McHistory” will reveal how the first McDonald’s burgers and fries were produced, tell the story behind our local Ronald McDonald House, and share the names of a few famous Springfieldians who once sold Big Macs. Great story. The Macks were a great family. I love looking at the old photos. Interesting story of the Mack Family. I enjoyed it. Can’t wait to read the next chapter. My grandparents were also Lithuania. They changed their name to Surgis from Sudruis. Thanks for sharing for family history. Fantastic amount of information, and so very well written. Thanks, for your diligence, Sandy. Thanks, Carol, I lived in Lexington, KY, for awhile, like some of your branch of the family. I think it’s interesting that according to Dorothy, John changed his surname to Mack before he ever new all the Mc-thises and Mc-thats would enter his life. More serendipity? My family lived 2 doors down from the Mack family on So. 1st st. They were the best neighbors and friends.